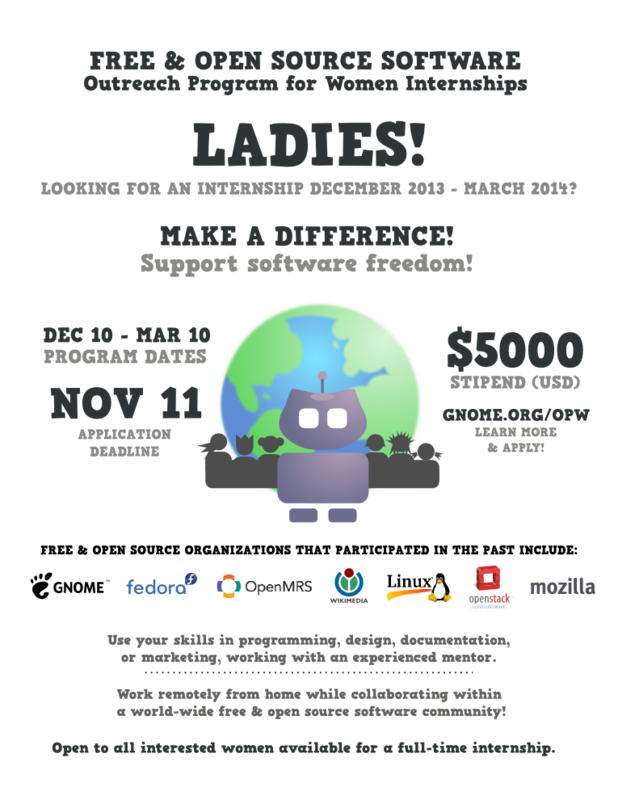 A big initiative for those interested in getting involved in open source is happening right now: the GNOME Outreach Program for Women (OPW). OPW is accepting applications from now until November 11, 2013 for the program that begins December 10, 2013 and ends March 10, 2014. Not that I’m biased or anything, but since I work for Mozilla, I’d like to call attention to our OPW projects. Several other organizations are participating as well — Debian, Fedora, GNOME, the Linux Kernel, OpenStack, Wikimedia, and Xen — and if you’re involved with one or more of those, you’re welcome to toot your project’s horn in the comments! This is the third time that Mozilla is participating in OPW, but the first time that Mozilla Research is participating. Because I work for Mozilla Research, on Rust, I’m excited that we’re accepting one intern each for Rust (a new systems programming language; most of the internships focus on libraries and tools for it) and Servo (a prototype parallel Web browser engine implemented in Rust), both of which are projects that are under the umbrella of Mozilla Research. A third Mozilla opportunity is to work on community building with Larissa Shapiro, Mozilla’s Head of Contributor Development. For the full scoop on all of these projects, see Mozilla’s OPW page for December 2013. I’m coordinating Mozilla’s involvement with OPW, as well as coordinating mentorship for the Rust projects; Lars Bergstrom is coordinating the Servo projects. If you’re not sure whether you should apply to OPW, then you’re probably somebody who should apply. But as the OPW page says, the application process is collaborative, so it’s a good idea to talk over email with the coordinator for the project you’re interested in to find out more about what they’re looking for in applicants. As always, it’s best to show that you’ve done your homework and ask specific, focused questions so as to help the potential mentor help you. If you’re not in the OPW audience, you can still help! Please advertise these programs to students and women who might not otherwise see them. You can put up posters where people who are marginalized in open-source communities will see them; help encourage people who are enthusiastic about one of the projects but might be too nervous to submit an application; and help connect the same people directly to projects whenever you can. I shamelessly ripped off portions of this post from Terri’s OPW/GSOC post from back in April. This entry was posted in Uncategorized and tagged gnome, Open source, opw, women in open source on 2013/10/28 by Tim Chevalier.